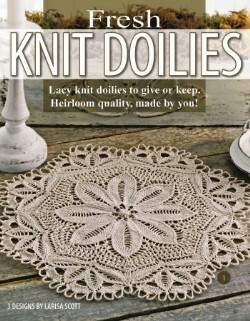 Delicate details and pleasing patterns make this trio of doilies truly charming. But don’t let their lighter-than-air appearance fool you! Because they’re knitted, you get a denser fabric than you would with crochet. That means these doilies need only a minimum of starch to help them hold their shape. Knit the Shasta Daisy, Dahlia, and Heliotrope doilies using bedspread weight cotton thread in your choice of colors; then get ready to hear lots of compliments on your lacy, lovely creations. Leaflet - 16 pages by Leisure Arts. ©2004 - 2019 Candle on the Hill. All rights reserved.